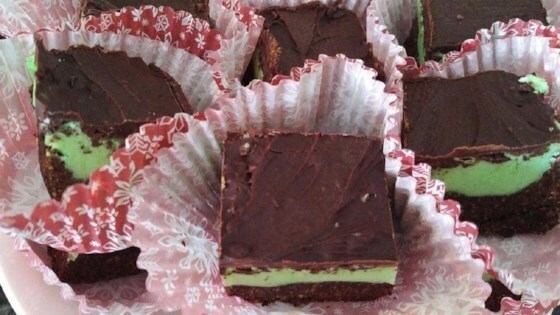 Melt 1 cup of mint chocolate chips and 1/4 cup of butter in the top of a double boiler over hot water, stirring to melt the chips and butter together into a smooth mixture. Remove from heat, and beat in 1/4 cup of confectioners' sugar and egg; beat well. Stir in graham cracker crumbs until well combined, and press the mixture into an 8x8-inch dish. Chill the crust in refrigerator for about 1 hour. In a mixing bowl, beat 1/4 cup of butter, 2 cups of confectioners' sugar, and milk with an electric mixer until the mixture is smooth and fluffy. Beat in green food coloring, 1 drop at a time, until filling reaches the desired color. Spread the filling over the chilled crust, and return to refrigerator for 30 minutes. Melt 1 cup of mint chocolate chips with 1/4 cup of butter in the top of a double boiler over hot water, stirring until the mixture is warm (not hot), smooth, and spreadable. Spread the topping in an even layer over the filling, and return the dish to the refrigerator. Chill until the topping is firm but not hard, about 15 minutes, cut into squares, and return to refrigerator for about 15 more minutes. Serve cold. Very Easy to make. For the topping I did half a cup milk chocolate chips and a half a cup mint chocolate chips.